A spacious room at the Hard Rock Hotel Vallarta. 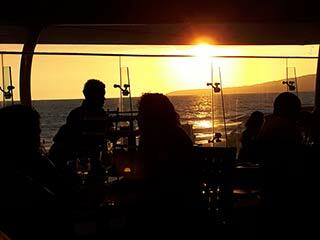 A glowing sunset from the Ciao restaurant. 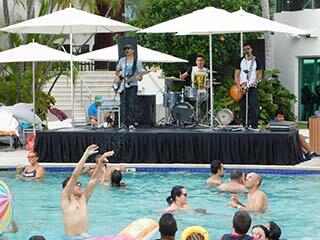 Live music and fun in the Hard Rock Hotel Vallarta pool. 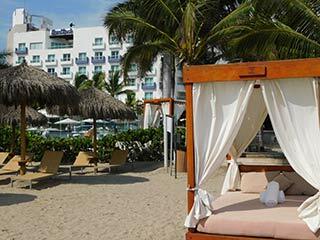 A comfortable resting place on the grounds of HRH Vallarta. 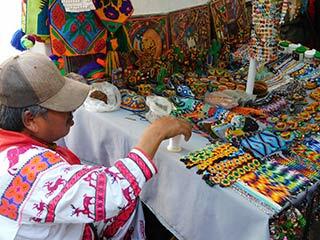 Traditional Huichol craftwork for sale in Sayulita. 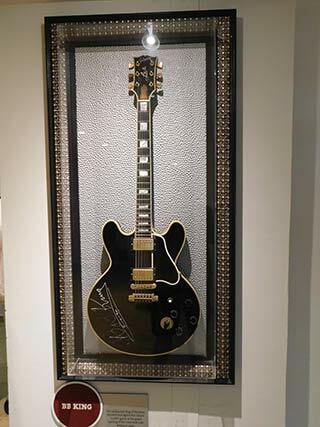 The HRH Vallarta rock memorabilia collection includes one of BB King's famed 'Lucille' guitars. It’s only rock and roll, but a lot of people still like it, as Open Jaw discovered on a quick weekend gig to the Hard Rock Hotel Vallarta. In fact, there were a lot of people you might not expect to see at a rock-and-roll memorabilia themed all-inclusive resort – like grandparents and babies – and for the few men sporting long rocker hair, the prevailing colour was grey. But no matter, guests at the 352-room Nuevo Vallarta property were there for fun in the sun to a classic rock beat, and there was plenty of that to be found. Winner of a 2017 TripAdvisor Certificate of Excellence, the PVR property is the smallest of the Hard Rock all-inclusives in Mexico and the D.R. It’s set on a glorious stretch of beach facing onto Banderas Bay, in a privileged position for guests to witness glorious nightly sunsets. The music theme prevails throughout the property, from the massive lobby wall art made completely from old instruments, to the glass cases showcasing the property’s collection of 186 items of music memorabilia. There’s something of interest for just about any rock fan, as the collection covers everything from Elvis to Christina Aguilera. There are song lyrics scattered on walls throughout the property, and guests can borrow an electric guitar and amp for their rooms, or an old-school turntable with a stack of iconic vinyl records. The music theme continues with outdoor yoga and treatments in the Rock Spa. Early Saturday morning yoga didn’t seem like a particularly rock-and-roll activity, but with a DJ playing new-agey versions of classic songs and the sounds of the waves crashing on the beach, a state of Zen was easily achieved. That was followed by a 50-minute ‘Synchronicity’ massage at the Rock Spa, where the mantra is “Live Hard. 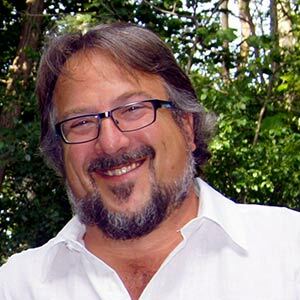 Purify Harder.” I was asked to choose from a selection of playlists, and the music pulsated through the massage table as the masseuse worked her soothing magic. Feeling relaxed and purified, I was ready to resume the hard rock lifestyle at the swim-up bar. Spacious guest rooms and suites are decorated in true Hard Rock style with custom furnishings and rock memorabilia. Even the pillowcases are embroidered with a Hard Rock guitar logo. Amenities include flat-screen TVs, stocked minibars, liquor dispensers, individually controlled air-conditioning units, Rock Spa toiletries, coffee makers and double Hydro Spa tubs. Standard rooms offer French balconies, upgraded rooms and suites have full balconies with inspiring pool and ocean views. Wi-Fi is free throughout the property and guests can make unlimited calls to Canada and the U.S. from their rooms. Room service is available 24/7 for all guests. 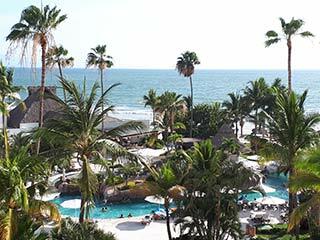 Befitting a CAA/AAA 4-Diamond resort, food choice and quality is high at the Hard Rock Hotel Vallarta. Breakfast at The Market makes for a great start, with things like an omelette station, crepes station, lots of fresh fruit, cheeses, meats, breads and plenty of Mexican selections. My Mexican breakfast isn’t complete without some chilaquiles, pico de gallo and green juice – that delicious blend of orange and pineapple juices, nopales (prickly pear cactus), celery and parsley -- and HRH Vallarta had it all. There are several specialty restaurants on offer, including Italian-flavoured Ciao, where sunset views compete with the cuisine, Frida for authentic Mexican dishes, Zen for Asian specialties and Ipanema for Brazilian meat specialties. In the pool area, Pizzeto quickly cooks up custom pizzas in a wood-burning brick oven. Groups, whether wedding or other, are in good hands at HRH Vallarta. Our small group of media and social influencers was catered to by Margarita (Magy) Lomelli, who was the picture of smiling competence. She was there for every scheduled event, ensured everything was perfect, then melted away. For activities outside the resort, all the attractions of Puerto Vallarta are less than half an hour away, including seasonal whale-watching, sizzling nightlife and excellent restaurants. We had the pleasure of being hosted by Guillermo Guerrero of the Riviera Nayarit Tourist Board for a half-day visit to the surf town of Sayulita, about 40 minutes up the coast from Nuevo Vallarta. There’s a nice surf beach, great handicraft shopping, quaint small hotels and some fine restaurants, including Don Pedro’s, where we had fabulous fresh oysters and grilled ahi tuna. Highly recommended. The Hard Rock Hotel Vallarta is highly recommended too, for music-loving couples and groups of friends, young families and multi-generational groups. The setting is terrific, the service, accommodations and food are of high quality and the soundtrack is the music of our lives.